Considering the craft that has gone into her artwork, I’m disturbed at the amount of times Caruso describes getting work returned to her damaged by whatever gallery had been showing it, holding onto it, or even returned from an arts jury with coffee stains on prints, and her frustration at having to explain, over and over again, why this is not only a problem but should be dealt with seriously (there are a couple of instances she’s forced to consult with lawyers). Why should making art be this hard? As a working writer, I’m frustrated for her, reading some of these entries, but relieved all at the same time (it isn’t just me who lives with frustration). As well as some extremely interesting entries dealing with individual artists and writers, as well as the Toronto community at large, what really makes this book is when Caruso starts to talk about her own pieces, what she was working on that week, that day, or simply working towards. It’s time to write about my two new paintings. I completed the second 77” x 66” painting on Saturday. This one is warm and bright – strong with yellow. The earlier one is more serene – reds dominate. The loose-edged colour-shapes in these works are not square, but rectangular shapes (each occupies about 22” x 33”). The straight-edged grey shape in each painting occupies an area equal to three of the loose-edged rectangular shapes. All the shapes are big and give each work a sense of bigness (as in “big and grey”). In Colour Lock, Grey Series #5, a purple shape and a blue shape lie horizontally at top. The straight-edged shape is a high value purple-grey; it is a T-shape that crosses from edge to edge below the horizontal colour-shapes and extends to the bottom edge at centre between two vertical colour-shapes, a low red and a green, at bottom right and left. In Colour Lock, Grey Series #6, the four colour-shapes are at the top and the grey shape is an inverted T-shape that crosses from edge to edge at the bottom of the painting. It is a yellow-grey. A blue and a green shape lie horizontally at top. Below them, a yellow toward green shape and a red toward orange shape stand vertically, separated by the inverted T-shape. This painting is warm and bright; the grey shape changes as it interacts with each other colour. The composition of these paintings is strong. The proportion of the colour-shapes (four parts) to grey shape (three parts) may be important. The grey shapes, which dominate by their positions, are activated by the colour-shapes. The ability of the greys to neutralize is reduced here; they become colour-active. I must think about this. These paintings are difficult to make; I have made six now and I’m only beginning to see what is happening in them. I have worked intuitively so far, but now I am recognizing the scope of the colour action in them. I wonder if these are transitional works, or are they truly a series in themselves. They can be both of these things, but I know that my thinking is expanding because of them. I have sketches toward two more paintings that I want to make. They will be even more difficult than the two I have just finished. 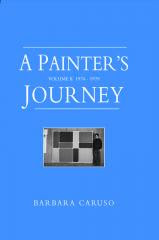 There is such an ease to the writing in both volumes of Caruso’s A Painter’s Journey, written in such a personal way that there is little separation between writer and reader, as though she is talking to someone very close to her. As in the previous volume, it would have been nice had some of her visuals actually been included, but some of her visuals can be found in her collection of arts/critical writing, Wording the Silent Art (Mercury, 2001), and this volume even ends with a list of her exhibition history. But as with the first volume, the question becomes, will there be more?